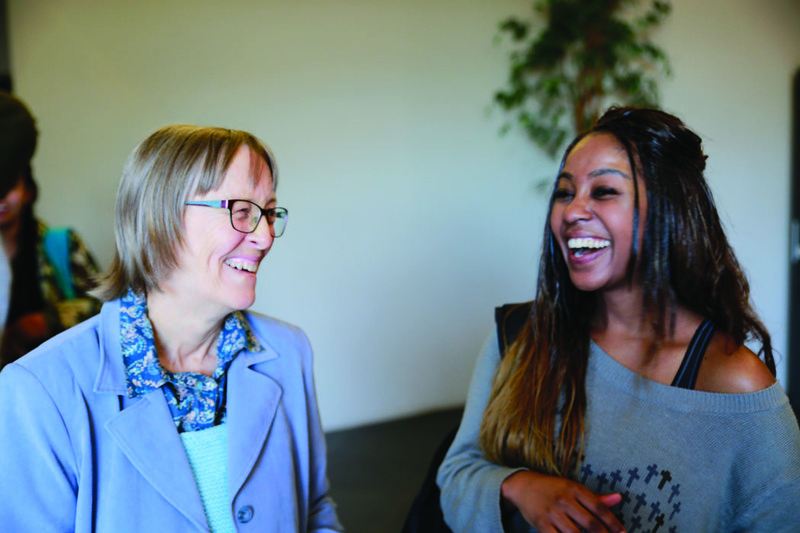 SIM South Africa missionary Sandy Willcox enjoys a moment with one of her TESOL training students. Individuals and churches looking for ways to serve the strangers among them might consider helping them learn English. Sandy, originally from Johannesburg, has been with SIM SA for nearly 30 years. She has served in education, student outreach, and urban evangelism in South Africa and Ethiopia. Two years ago, she established a TESOL (Teaching English to Speakers of Other Languages) training programme at a local college in Cape Town. “It’s the only place that I know of in Africa that has TESOL as part of an undergraduate degree,” she said. The programme consists of four university-level modules totalling 56 credits and includes instruction, study, observation, and practice. It can be taken by full-time students as a two-year minor within their three-year degrees or by others as a stand-alone programme. Many of the students have completed the basic 120-hour module. Recent graduates taking a gap year, teachers wanting to refresh their skills and knowledge, and workers seeking new challenges as they approach retirement are among those Sandy believes could find TESOL rewarding. As well as helping neighbours improve their lives, TESOL can also help pastors and missionaries get better training. Sandy said that about twelve students have completed the first two modules, and several of her students are already putting the lessons into practice. One is helping children at a school in Hout Bay, three more are preparing to go to South Korea next year, and a fifth is looking at teaching in another part of Asia. “So although it’s been going for a short while with only a few students completing the course, I’m already seeing students using it to serve,” she said, adding that she hopes the programme will grow to have about fifteen students at each level. Anyone interested in more information about entering or supporting the TESOL programme should contact Sandy Willcox directly at sandy.willcox@sim.org.